Early this year my boyfriend and I were discussing theatre, as I am wont to do. As a film critic he is perfectly at home in the world of cinema, but prior to meeting me the world of theatre was something he was largely unfamiliar with. I didn’t exactly take it upon myself to teach him, that would be horribly condescending, but I did want to share with him what had been, until I met him of course (ahem), my one true love. We went to various plays, saw various dramas, both classical and modern, but eventually talk turned to musicals. It’s not surprising really- these are most peoples only exposure to theatre, with the big blockbuster musicals spending thousands on advertising, running for years and years and building a pretty hefty fan base along the way. When he was younger, James had seen a particularly dreadful musical that shall remain nameless, and was put off ever since. However, being a nice sort of fella, he humoured me and agreed to come along to a musical. We started with Les Miserables. This was my favourite musical for many years and I maintain that it has the most beautifully written score on the West End. We saw the show when Alfie Boe was in the role of Jean Valjean, and I can’t think of a better way to introduce a theatrical newbie to musicals. Les Mis has lost none of the passion that made it such a smash-hit, and the story of the convict on the run, set against the backdrop of the French Revolution, remains compelling and rich, though the staging and sets have become quite dated. The score is rousing and certainly never dull, tripping easily from ballad to an energetic call to arms. Because the score is so familiar, the cast do have a job making it their own, and some manage more successfully than others. Alexia Khadime as Eponine attempted a soulful rendition of On My Own which fell flat, the warbles and trills jarring against the classical style the rest of the cast were adopting, but she still gave an emotional performance, and no one could argue that by god the girl can sing. Stand out performances included Hadley Fraser, who brought me to tears as Javert, and Fantine, who in my opinion has never been played better than by Caroline Sheen, but I don’t think anyone in the audience would argue that the show belonged to Alfie Boe. Boe is just a force of nature, belting out the tunes with seemingly no effort at all. He was just incredible. 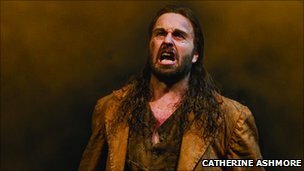 Not only was his powerful tenor voice perfectly suited to the role, but he managed to pack each moment he was on stage with such emotion that it was difficult to focus on anything other than him. He also holds back from unleashing his voice completely in order to blend into the cast better, which shows great restraint and made a big difference to the show as a whole. There is a reason Les Mis has lasted the test of time, and it’s certainly worth another visit. My only regret is that certain elements are a bit dated, certain set pieces and sequences jarring slightly on someone who is used to pared down staging. Javert’s death is an excellent example of this, the rolling off the stage looking ugly and messy when his stance beforehand, arms raised to the heavens at the bridge rises behind him, could have been a perfect farewell to my favourite character. The barricades look a little old – but until I think of a suitable alternative I won’t slate it completely. From an old favourite, to a new contender! Our trip to the New Theatre, Oxford was the first time I have seen Sister Act on stage, but have heard nothing but good things so thought it was worth a punt. The show follows the same story as the hit film – Reno lounge singer, Delores Van Carter witnesses her boyfriend killing a man in the midst of a shady deal, so flees and it placed in the witness protection programme, hiding in a convent. There, she manages to transform a group of seemingly tone deaf nuns into a soulful gospel choir that brings new life to the church. For fans of the original film, it is worth noting that none of the songs feature in this stage version. However for me, that is not a problem, in fact, it works in the shows favour. Alan Menken’s score is great fun, perfectly evoking the spirit of 1970’s disco and soul classics, where this is now set. I really enjoyed this version of Sister Act. Cynthia Evro as Dolores was outstanding, belting out each song with power and emotion, and the cast seemed to work incredibly well together, lighting up the stage with energy and fun. I just couldn’t help thinking that touring this show must be one of the most fun tours around at the moment. However, I seem to have missed a trick. This show was good, very good in fact, but anyone that had already seen this on the West End emerged decidedly glum. Apparently this is a pale comparison of the West End version, being incredibly restricted by the smaller stage. I didn’t notice this at the time, but thinking about it, certain elements did seem a bit cramped. There were also comments that Evro wasn’t as good as the West End’s Dolores, but once again, I didn’t have that comparison so loved it. There’s always a risk of this kind of criticism when a show this big goes on tour, but I think for the most part these criticisms can be ignored. Of course the West End show is on a larger scale, but that doesn’t detract from what has been achieved here. There was a really warm reaction from the audience on the night I was there, and as we were leaving young and old alike were laughing and still dancing as they walked down the street – what more could you ask for? So there you go – I don’t do musical reviews particularly often, but there’s a double bill for you. Two vastly different shows, showing my non-theatrical boyfriend the range of musicals on offer. See James? They aren’t all like Martin Guerre…I’ve said too much.